Detail of an ornamental gate in Charleston. Love the brass insets in the shape of a star and flourishes. A custom-designed iron gate in a northwest DC garden designed by Corinna Posner of European Garden Designs. A glorious iron fence with decorative panels at Magdalen College, Oxford sets off the herbaceous border in front of it with style. Blenheim Palace’s gates are very grand and have lots of nice glittery gold bits. Then there are opportunities to think outside of the box a little bit, either practically or to add a stand-alone sculpture to a space. A custom-made bike rack near the parking lot at Chanticleer – where form mimics function perfectly. Another iron bike rack, this one at the Morris Arboretum outside Philadelphia. A freestanding metal sculpture (OK, probably not iron!) that would look right at home in someone’s garden. This, however, is found at the University of Georgia’s Botanical Garden (in Athens, Georgia). What about the front garden, you say? Small space? How about an interesting railing or two? Chanticleer’s magic includes a whimsical iron railing with supports that look like plant tendrils. Iron railings enclosing a front stoop in Georgetown are designed along a musical theme – a lyre. For something really out of the box – if you have a sizeable garden – consider rusted ornamental orbs like these or commissioning something from Andrew Crawford’s ironworking shop in Atlanta. Or let me know if you’ve come across something in your travels you’d like to share, and I’ll add it to the list! One of the things that struck me while in Cuba was the passion for the arts that I saw in almost every setting. Dance, music, visual arts, every aspect you can imagine. The very first day, our SFWorkshops group was treated to an amazing “rehearsal” event by a dance group called Ban Rarra, in a beautiful but decaying theater within walking distance of our hotel. 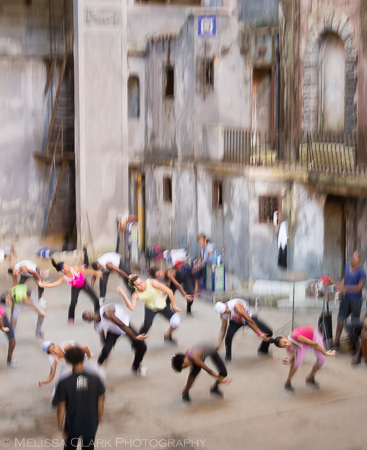 Ban Rarra practices and performs in a large, crumbling theater space in downtown Havana. The dancers are apparently all professionally trained graduates of the Escuela Nacional de Arte. Their energy and talent were unmistakable. We watched an hour-long “rehearsal” that was almost non-stop, and were allowed to photograph from any and all perspectives – on the main floor as well as from two levels of balconies (which required careful navigation). Because the light was very low and tripods not an option, I chose to shoot almost exclusively using camera motion and shutter priority set on 1/20th of a second (the ISO settings were insanely high). Hope you enjoy this look at an incredibly talented troupe, and if you’re every fortunate enough to visit Havana, try to get to one of their performances.